A Rancher And A Conservationist Forge An Unlikely Alliance Scientists suspect that warming air and rivers, as well as smaller winter snowpack, is endangering western trout. But on a ranch in Montana, methods to protect trout from the effects of cattle ranching are helping the trout become more resilient to the inevitable change in their environment. But Western trout may be in trouble. The climate is changing and biologists are headed to trout country to find out the effect on this iconic fish. And Schoendoerfer's one-room shop in Ovando is at the heart of that country. It's stocked with lures, fly-rods, boots — anything you'd need to wade into the nearby Blackfoot, the famed river of trout. On the Blackfoot, anglers will stand thigh-deep in rushing water and cast, zen-like, for hours, awaiting the perfect bite. But this year hasn't been so good. 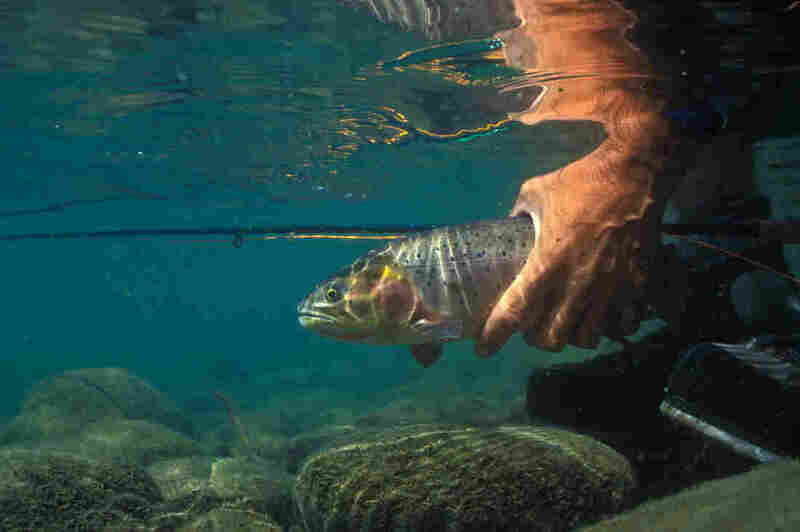 The winter's snowpack was small and water temperatures were high, which hurts the trout. For a while, the Blackfoot was closed to fishing. "If we don't have a snowpack," says Schoendoerfer, "we don't have water in the mountains that comes down all summer, and we get low waters. And then we have to close up the Blackfoot due to low flows like we did this year." Scientists have measured snowpack, and air and water temperatures as well. They confirm that on top of natural cycles of weather, the climate is changing. Locals have noticed as well. "I think people understand that there is climate change," she says, "they just don't know who to point fingers at." Someone who has noticed these changes in climate is Randy Mannix, who shares a cattle ranch with his brothers not far from Ovando in western Montana. Mannix's family has been ranching here for five generations. His cattle now are grass-fed, and that requires a lot of pasture-land, a lot of grass and a lot of water. Several creeks run through Mannix's property, but there's been a lot of drought recently. "Whether it's from global warming or natural cycles, I'm not sure," says the quiet-spoken Mannix, "but there is a difference." Mannix, dressed in Carhartt overalls and muddy boots, takes me through tall grass to a creek. He diverts water from it to irrigate his pastures and water his cattle. With us is Stan Bradshaw, with a conservation group called Trout Unlimited. 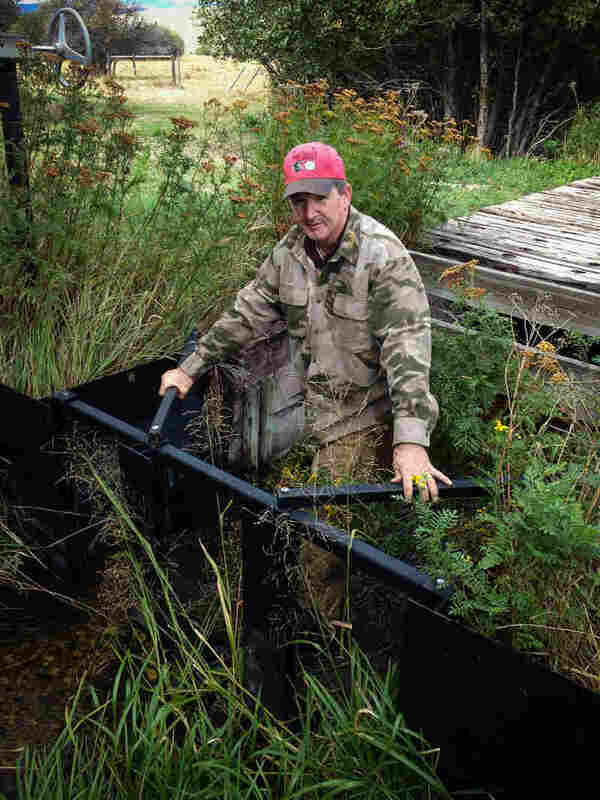 Where Mannix sees irrigation, Bradshaw sees trout habitat. "What you have here is a nursery," Bradshaw says. "These tiny streams — you cross this in the road, [and] you can't even see it. They're literally the life blood of the main-stem rivers that are trying to support native fish." Bradshaw says two things are threatening that life-blood: heavy cattle grazing and a warming climate. The cattle muddy up and flatten out the streams with their hooves. A warmer climate dries up streams and overheats them. But he says there are solutions to the damage to trout caused by both cattle and a warmer climate. Things like "narrowing these over-wide stream channels, getting more depth in them so water will flow more quickly through them; adding water back into the system where there wasn't enough water; planting trees and stream-side vegetation that would create shade." That sounds like a lot of work, but Bradshaw and Mannix have been doing it here. Mannix keeps cattle out of the creek. He plants stream-side grass. He stops taking water out of the streams for his pastures and cattle when the stream-flow is low. He says it works. "This particular spot used to be a broad mud-hole," he says, pointing to what is now a narrow stream-bed with clear, rushing water running through it. "It healed itself in less than five years, I'd say. This little section of the creek is about as ideal as you can get, where it's real narrow and deep and it's all shaded with grass." Adds Bradshaw: "And this is ideal because part of getting temperature down is getting them [streams] out of the sun. And this grass and the willows and everything else just is an ideal [way] of getting that done." Although Trout Unlimited financially supports some of this environmental work, Mannix says it's still a hard sell for many ranchers. He says many worry that if they give some of their water rights up for trout, eventually they'll end up giving up a lot more. And water is precious in western Montana. But then so are trout. Trout-fishing brings tens of millions of dollars to the state every year. Not as much as the value of cattle, but there is a mystique about trout in Montana. The writer Norman Maclean captured it in what might be the most famous fishing book ever, A River Runs Through It. It took place along the Blackfoot. At her shop in Ovando, Kathy Schoendoerfer says she keeps selling out of copies. When she reads from the book — and she does it with the kind of emotion you might expect from a life-long trout enthusiast — you can understand why. " 'Like many fly fishermen in western Montana,' " she reads, " ' where the summer days are almost Arctic in length, I often do not start fishing until the cool of the evening. Then in the Arctic half-light of the canyon, all existence fades to a being with my soul and memories and the sounds of the big Blackfoot River and a four-count rhythm, and the hope that a fish will rise.' "